Most of the hookah tobacco used in the United States is imported from the UAE, Jordan, Egypt and Saudi Arabia; as a way of catering to Western tastes, tobacco manufacturers are introducing flavors like kiwi, watermelon and blackberry. Handcrafted pipes made of glass and brass are produced in Syria and Egypt, although China is making less expensive pipes out of acrylic. Pipes cost between $50 and $180. In lounges and bars, the tobacco is sold in batches for as little as $5 or as much as $20. One batch can last a person an hour or longer. Contrary to popular belief that hookah is less harmful than cigarettes, a 2005 study by World Health Organization has concluded that a typical hour-long hookah smoking session does as much harm as 100 cigarettes. This study puts the hookah tobacco merchants in the same category as Philip Morris, often described as a merchant of death. Philip Morris has been heavily promoting to achieve double digit growth in demand for is tobacco products in developing nations such as China, India and Pakistan. The WHO study also found that the water in hookahs filters out less than 5 percent of the nicotine. 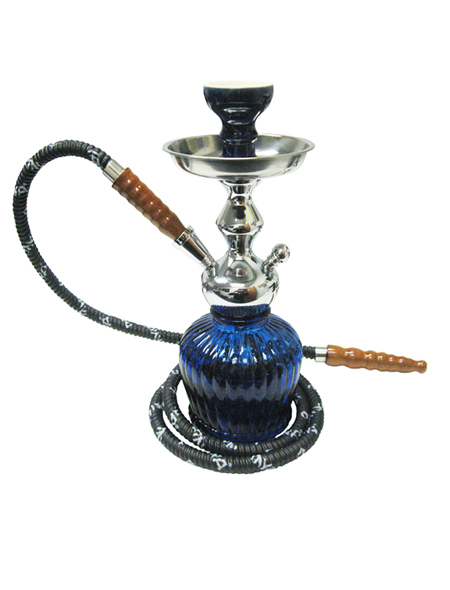 Also, hookah smoke contains tar, heavy metals and other cancer-causing chemicals. An additional hazard: the tobacco in hookahs is heated with charcoal, leading to dangerously high levels of carbon monoxide, even for secondary smokers, according to a recent University of Florida study. No surprise, then, that several studies have linked hookah use to many of the same diseases associated with cigarette smoking, like lung, oral and bladder cancer, as well as clogged arteries, heart disease and adverse effects during pregnancy. And because hookahs are meant to be smoked communally — hoses attached to the pipe are passed from one smoker to the next — they have been linked with the spread of tuberculosis, herpes and other infections. Many young Americans are attracted to the sweet, aromatic and fruity flavors of hookah smoke, which causes them to mistakenly believe it is less harmful than hot, acrid cigarette smoke, according to a report in the New York Times. Hookah was reportedly invented by a physician, Hakim Abul Fath, in Emperor Akbar's 16th century court in India as a less harmful method of tobacco use. Growing up in South Asia, I saw mostly older people smoking hookah. And they, too, believed the myth that the water filters out much of the harmful components of the tobacco smoke in a hookah. In fact, my grandfather was an avid hookah smoker and lived a healthy life well into his nineties. So did one of my hookah-smoking uncles, while my father, a non-smoker, died at the age of only 69. The American Lung Association, however, is not persuaded by such anecdotal evidence. It is campaigning for hookah bar bans at colleges and in cities across the United States. Smoking has also got some advantages, this is what the new studies suggest. It helps to ease the mental stress in patients with Psychophrenia. Also, it influence the dopamine system in the brain, thus reducing the chance of Parkinson disease. It was used by Americans for drugs before. I gave a decorative one to a Professor once who gave me starnge look. I asked him why and he told me used to smoke pot!